No, it's not an Evo. Don't let your eyes deceive you. 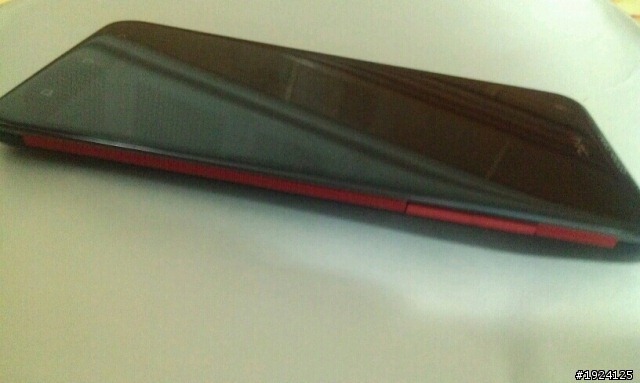 What you're looking at are leaked pictures of an in-development HTC device. We don't know much about this one just yet. The phone lacks any carrier-specific branding, though the red accents are pretty typical of Verizon color schemes, such as the Droid Incredible. The site that posted these photos originally, PhoneHK, makes mention of this being a 5" device. Combined with the Verizon-ish color scheme, one might be tempted to believe that this is an early look at the Note-like device we've heard about previously. That HTC phone was rumored to have a full 1080p display, with a quad-core Krait-based S4. The one detail that doesn't quite fit is that, if this is that phone, the resolution is said to be 1794x1080. We hypothesized that this odd resolution might be due to shaving off a few lines for software buttons (1794 + 126 = 1920). However, this device appears to have capacitive buttons. Of course, it could be that this phone just has an odd resolution. 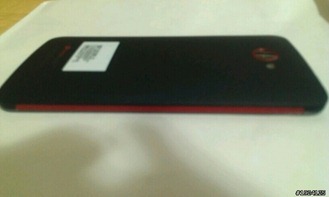 The other theory is that this is really the HTC One X+. Unrelated rumors are that the Taiwanese manufacturer is planning a spec boost for the One X, to a 1.7GHz Tegra 3 processor, and that the new version will ship with Jelly Bean. Of course, if this thing does pack a T3, chances are very low that it will be coming to any US carrier with LTE (like Verizon). Sprint and Verizon certainly don't have a monopoly on black phones with red trim, so it's certainly possible that this is an international device with beefier specs. Hopefully we'll see before too long.